Officer McLellan was struck and killed by a vehicle while he and several bounty hunters chased a suspect. The incident occurred on the Kensington Expressway as Officer McLellan crossed the roadway during the foot chase. The suspect was apprehended after the incident and charged with manslaughter in connection with Officer McLellan's death. Officer McLellan had served as a sergeant with the Buffalo Housing Police prior to serving with the Buffalo City Police for 1 year and being assigned to precinct 12. He is survived by his four children. 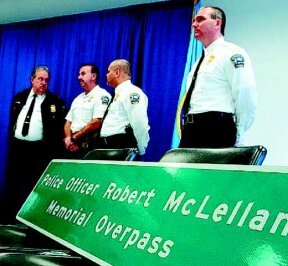 Today marks the seventh anniversary of the death of Buffalo Police Officer Robert J. McLellan, but his spirit lives on. 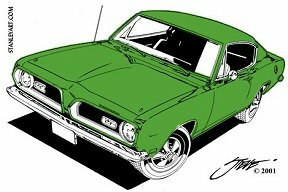 McLellan's spirit lingers on in his most-prized possession, his classic muscle car, a restored 1969 340 Formula S Plymouth Barracuda, which was passed on to his brother, Harold, who keeps the car covered and stored inside a garage as a sentimental memorial. Now McLellan will be memorialized with the green-and-white roadway sign that was unveiled at a ceremony Thursday morning in Police Headquarters. The new sign dedicates the pedestrian overpass on the Kensington Expressway, near Cherry Street, in honor of McLellan, 35, who was killed when hit by a car as he chased a fugitive across the expressway at around 6:30 a.m. on Feb. 25, 1998. 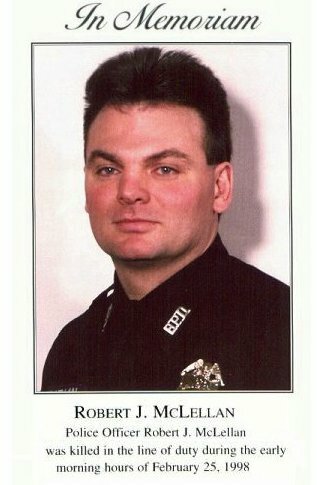 (Albany, N.Y.) On February 25, 1998, the senseless death of Buffalo Police Officer, Robert J. McLellan, prompted the State Legislature to enhance the safety of citizens and law enforcement personnel from potentially irresponsible behavior of bounty hunters. Officer McLellan died as a result of his efforts to apprehend a fugitive being aggressively pursued by five bounty hunters from the State of Maryland. Western New Yorkers all felt a sense of loss when this tragic event occurred, especially for the family of Officer McLellan. An outdated and archaic 1872 Supreme Court ruling gives bounty hunters the authority to operate without any rules and regulations. In fact, this ruling gave bounty hunters extraordinary powers to seek and return fugitives and extradite fugitives across state lines and enter homes without a search warrant; which in effect, gave bounty hunters greater powers to apprehend fugitives that current law enforcement personnel do not possess. In order to prevent similar tragedies in the future, Assemblyman Robin Schimminger and I worked in a bipartisan manner to pass legislation that would regulate bounty hunters (a.k.a. bail enforcement officers) working in New York State. This legislation is not meant to put bounty hunters out-of-business in New York State; but only regulate a profession which for too long has run "rough shod" in our communities. Officer McLellans's death has not gone in vain, but has brought about a common sense law that protects our fathers, mothers, sons and daughters from being harmed by reckless and dangerous behavior. It's been a long and tenuous road in establishing reasonable legal guidelines to promote professionalism among bounty hunters working in New York State. However, the Governor and the State Legislature have taken appropriate and reasonable action in preventing the senseless death(s), the damage of municipal and personal property or inflicting injuries to our law-abiding public. When all is said and done this new State Law will bring reasonable accountability and oversight of bounty hunters. It defies common sense, but prior to the enactment of this bill into law, no certification or formal training was required to become a bounty hunter. Any individual could have automatically begun working as a bounty hunter, chosen to purchase bounty hunter books, or purchase on the Internet an "official" certificate and badge. This, in effect, gave bounty hunters impunity, which allowed them to work in a careless and reckless behavior. This new law will now require bounty hunters working within New York State to complete a 25-hour basic training course certified by the New York State Secretary of State; hold bounty hunters liable for wrongfully causing damage to a person or property; and require bounty hunters to notify the local law enforcement agency having jurisdiction in the area of the search of the fugitive. This new State Law is the right thing to do, and I am pleased that Assemblyman Schimminger and I have been able to bring this important public protection policy to fruition. This law is not about overburdening the profession of bounty hunters, but only to make sure that when law-abiding citizens walk the street or drive their vehicle, they are not injured, maimed or killed due to reckless and careless behavior of a potentially untrained and overzealous individual in the pursuit of a fugitive. People v DaCosta, 13 AD3d 1141, affirmed. While being chased by a police officer, defendant scaled a tall fence and ran across a major highway during morning rush-hour traffic. The officer followed, but was struck [*2]and killed by a vehicle when he fell from the fence into oncoming traffic. The issue in this case is whether the evidence presented at trial was legally sufficient to support defendant's conviction for manslaughter in the second degree. We conclude that it was. In 1996, defendant was charged in Maryland with several cocaine-related felony offenses. He pleaded guilty to one felony crime and was sentenced to a period of incarceration, to be followed by probation. Defendant was subsequently arrested for allegedly violating the terms of his probation and was released from custody on a $50,000 bail bond. An arrest warrant was issued after he failed to appear in court. Darrell Love, the owner of the company that issued the bail bond, believed that defendant had fled to Western New York. Love traveled to Buffalo with four of his employees, planning to have defendant taken into police custody and returned to Maryland in order to prevent forfeiture of the bail bond. Upon arriving in Buffalo, Love contacted the local police and provided them with an address where defendant was suspected of hiding. Buffalo police officers met Love and his associates at the location identified by Love. They surveyed the perimeter of the residence but saw nothing suspicious. The police officers, who did not have a warrant to enter the premises, left the vicinity. The bail bondsmen, however, returned to their van parked nearby and placed the building under surveillance. A short time later, the men observed defendant, his girlfriend and his brother enter a nearby fast-food restaurant. The bondsmen notified the police but, before they could respond, defendant and his companions left the restaurant and boarded a bus. While following the bus in their vehicle, the bondsmen provided updated information to the police. The bus eventually stopped and was intercepted by a police car. Realizing that the bus had been blocked by the police, defendant and his companions disembarked and began to run away. Officers Knecevic and McLellan pursued defendant and his brother, ordering them to stop. During the chase, defendant and his brother ran in different directions. Knecevic followed defendant's brother toward a pedestrian overpass that traversed the Kensington Expressway where the brother was eventually apprehended. Officer McLellan pursued defendant as he ran toward the expressway. A witness to the incident informed the police that defendant had run into a nearby residence, where police found and arrested him. A grand jury subsequently indicted defendant on one count of manslaughter in the second degree, charging that he recklessly caused the death of Officer McLellan. The case proceeded to trial and, at the close of the People's case, defendant moved to dismiss the indictment, arguing that the evidence was insufficient to prove that his actions caused McLellan's death. County Court denied defendant's motion. After the defense presented two witnesses, defendant renewed his motion to dismiss, but the court adhered to its previous ruling. The jury found defendant guilty of second-degree manslaughter. He was sentenced to an indeterminate prison term of 4½ to 13½ years. The Appellate Division affirmed, concluding that the evidence was sufficient to establish that defendant's conduct was reckless and the legal cause of Officer McLellan's death, having set in motion the chain of events resulting in his fatal injuries. A Judge of this Court granted leave to appeal. Defendant argues that the evidence presented at trial was insufficient to support the conviction. Relying on causation principles articulated in corporate liability cases such as People v Roth (80 NY2d 239 ) and People v Warner-Lambert Co. (51 NY2d 295 , cert denied 450 US 1031 ), defendant contends that the legal cause of death was not his conduct but rather Officer McLellan's "ill-fated" decision to climb over the chain-link fence. Defendant also claims that there was insufficient evidence that his decision to scale the fence and run across the Kensington Expressway while being pursued by the police was reckless. The People assert that defendant's sufficiency arguments are unpreserved and, in any event, meritless. Initially, defendant failed to preserve his contention that there was insufficient evidence of recklessness because he did not raise this argument as a basis for his trial motion to dismiss. Defendant, however, did contend that there was insufficient evidence with regard to causation and reasserted that claim at the close of proof. As such, the issue of causation was preserved for review and is properly before us. To be held criminally responsible for a homicide, a defendant's conduct must actually contribute to the victim's death (see People v Stewart, 40 NY2d 692, 697 ) by "set[ting] in motion" the events that result in the killing (People v Matos, 83 NY2d 509, 511 , citing People v Kibbe, 35 NY2d 407 ). Liability will attach even if the defendant's conduct is not the sole cause of death (see Matter of Anthony M., 63 NY2d 270, 280 ) if the actions were a " 'sufficiently direct cause of the ensuing death' " (People v Stewart, 40 NY2d at 697, quoting People v Kibbe, 35 NY2d at 413 [emphasis omitted]). More than an " 'obscure or merely probable connection' " between the conduct and result is required (People v Stewart, 40 NY2d at 697, quoting People v Brengard, 265 NY 100, 108 ). Rather, an act "qualifies as [*4]a sufficiently direct cause when the ultimate harm should have been reasonably foreseen" (People v Matos, 83 NY2d at 511). Our analysis in this case begins with People v Matos (83 NY2d 509 ). The defendant in that case was in the process of robbing a restaurant when police officers arrived. The defendant ran toward the back of the restaurant and up a ladder that led to the roof. An officer pursued him up the ladder and across the roof, but died after falling into an open, 25-foot air shaft. We affirmed the murder conviction, concluding that the "defendant's conduct set in motion and legally caused the death" of the police officer because, had the "defendant not first committed an armed violent felony and then attempted to escape by way of the roof, the officer would not have pursued him onto the roof, thereafter plunging to his death in the airshaft" (id. at 511). We further determined that the defendant's actions were a sufficiently direct cause of the death because it was "foreseeable that someone might fall while in hot pursuit across urban roofs in the middle of the night" (id. at 512). People v Kern (75 NY2d 638 , cert denied 498 US 824 ) is also instructive. The defendants in that case instigated a vicious, armed attack against three young men whose car had broken down. All three victims fled the initial altercation, but were chased by the defendants. One of the victims (Griffith) ran until he reached the end of a street and decided to jump over a guardrail and onto a New York City highway. He ran across three eastbound lanes of traffic before scaling the center median and entering the westbound lanes of the highway, where he was struck by an automobile and killed. We concluded that the evidence was "sufficient to support findings that defendants' actions were a 'sufficiently direct cause' of Griffith's death" because, even though there was a potentially less dangerous escape route, "it was foreseeable and indeed probable that Griffith would choose the escape route most likely to dissuade his attackers from pursuit" (id. at 658). Furthermore, "[t]he evidence was sufficient to prove, beyond a reasonable doubt, that [the driver's] operation of his automobile . . . was not an intervening cause sufficient to relieve defendants of criminal liability for the directly foreseeable consequences of their actions" (id.). Here, as in Matos, the evidence was sufficient to prove that defendant's conduct "set in motion and legally caused the death" of Officer McLellan (83 NY2d at 511). Defendant was a fugitive felon who, upon encountering the police, decided to flee. Defendant was aware that he was being pursued as he neared the expressway since additional orders to halt were issued after the chase began. Had defendant not fled, Officer McLellan would not have faced the circumstances that ultimately resulted in his death. We are not persuaded by defendant's reliance on precedent that addresses causation in the context of corporate liability. People v Warner-Lambert Co. (51 NY2d 295 ) involved dual explosions that occurred because of a complex manufacturing process that produced an airborne chemical dust and highly volatile liquid oxygen. We noted that the evidence regarding what actually triggered the explosion of these substances was "hypothetical and speculative" (id. at 304) and, as a result, was insufficient to prove that the defendants' conduct was a direct, substantial cause of the explosion. In People v Roth (80 NY2d 239 ), the evidence was insufficient to show that it was foreseeable that an "employee would place the unprotected trouble light in the path of the high pressure washer during the tank cleaning operation and that an explosion-causing spark would result" (id. at 244). The case before us, of course, involves neither commercial nor manufacturing processes. Instead, it is more appropriately categorized with cases that address the foreseeable dangers inherent in police pursuits of fleeing felons (see People v Matos, 83 NY2d 509 ) or actions that cause a person to be on or in the vicinity of a major highway (see People v Kern, 75 NY2d 638 ). Chief Judge Kaye and Judges G.B. Smith, Ciparick, Rosenblatt, Read and R.S. Smith concur. Footnote *: To the extent defendant claims that causation should not attach because he was on the far side of the expressway at the time Officer McLellan fell, this contention is without merit because there was sufficient evidence that defendant had not yet "reached any place of temporary safety" (People v Gladman, 41 NY2d 123, 130 ).